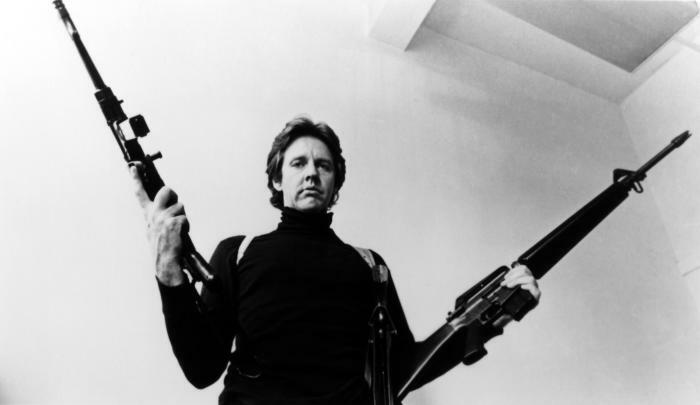 Digi-Schlock: THE EXTERMINATOR (Synapse Blu-Ray/DVD Combo) – Schlockmania! Nothing warms a cult movie fanatic’s heart like seeing a classic get properly treated on home video. The flip side of this joy is dealing with titles that go through multiple video incarnations without anyone ever getting it quite right. Take The Exterminator, for instance. Long a beloved title with action fanatics and exploitation movie buffs, it had to wait a long time to get its due on home video. The original VHS versions of this title were edited, cutting a lot of key content that gave this hard-hitting film its big punch. It was restored to its full running time for DVD but passed through two incarnations with the same non-anamorphic, soft-looking letterboxed transfer. 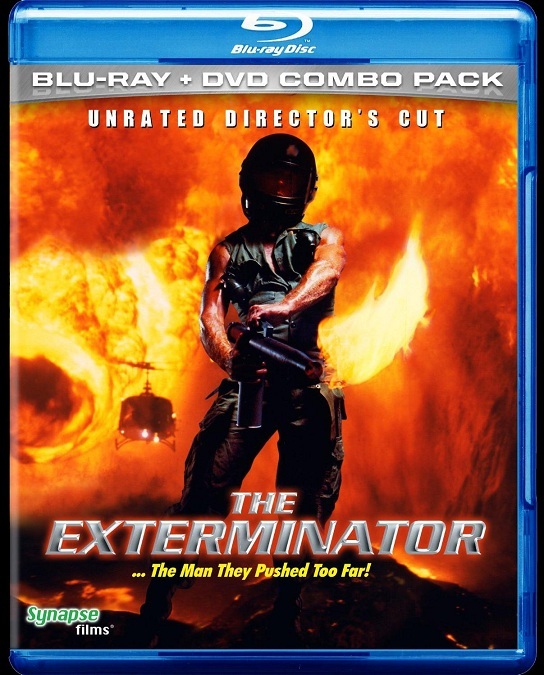 Thankfully, Synapse has turned this situation around with their recent blu-ray/DVD combo edition of The Exterminator. It’s a noteworthy upgrade on all past video versions, boasting an impressive new transfer using a new high-definition master created by the label itself. Synapse honcho Don May is a veteran of restoring classic films – The Texas Chainsaw Massacre and Night Of The Living Dead are just two of the classics that have benefitted from his remastering know-how – and The Exterminator is another feather in his cap. The new master hits the right balance of clarifying the rough-and-tumble stylishness of Robert Baldwin’s cinematography, raising the quality of color and detail substantially, while faithfully retaining a proper film look and appropriate amount of grain that reflects its nocturnal, guerrilla-shoot aesthetic. Fans used to the indistinct, pale look of past transfers will be impressed by the robust look The Exterminator has on this set. The audio component film also benefits from new work on this edition. 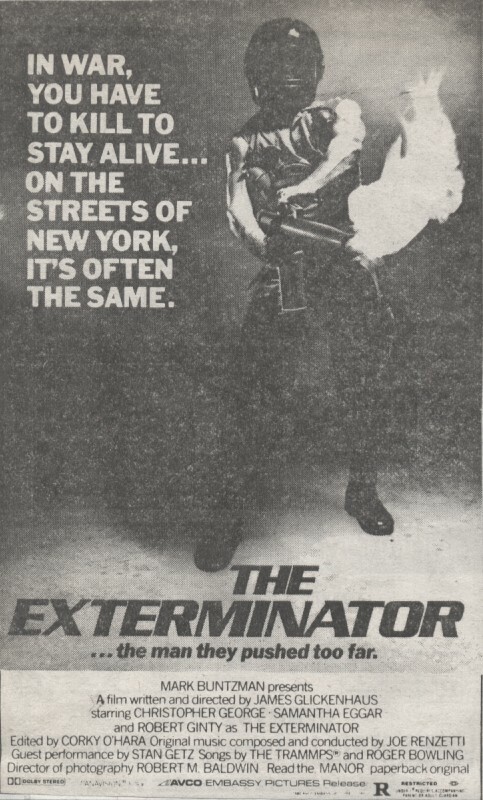 The Exterminator was one of the early films to benefit from a 2-channel Dolby Stereo mix – in fact, it was the first New York film to get this kind of audio treatment – but prior DVD’s have relied on a mono mix for their soundtracks. The Synapse set offers the viewer the choice of the mono track or the original Dolby Stereo mix. The Dolby mix was used for this review: don’t expect the whiz-bang effects and separation of a modern Hollywood mix but it does add a noticeable boost of clarity and added oomph to the soundscape, especially during the big action setpieces. Extras are limited on this set but what’s there is killer. Things start with a theatrical trailer and a reel of t.v. spots for the film. Both are good vintage fun, with the t.v. spots adding entertainment through the different marketing hooks it tries out in its choice of scenes and narration (Your Humble Reviewer’s favorite bit: the t.v. spot that begins with the declaration “He’s not a Taxi Driver and he doesn’t have a Death Wish…”). The other extra is a commentary track with director James Glickenhaus, moderated by Chris Poggiali of Temple Of Schlock fame. Glickenhaus is low-key but once he warms up he’s got plenty of fascinating trivia to offer about the locations, the cast, the methods used to achieve the film’s big shocks and the scenes that caused wrangling with the MPAA. Poggiali does a good job of keeping Glickenhaus engaged, asking interesting questions and supplying plenty of quality trivia of his own to flesh out Glickenhaus’ recollections (he’s particularly good at identifying character actors). The end result is worth the time investment for fans. In short, Synapse has racked up another winner. 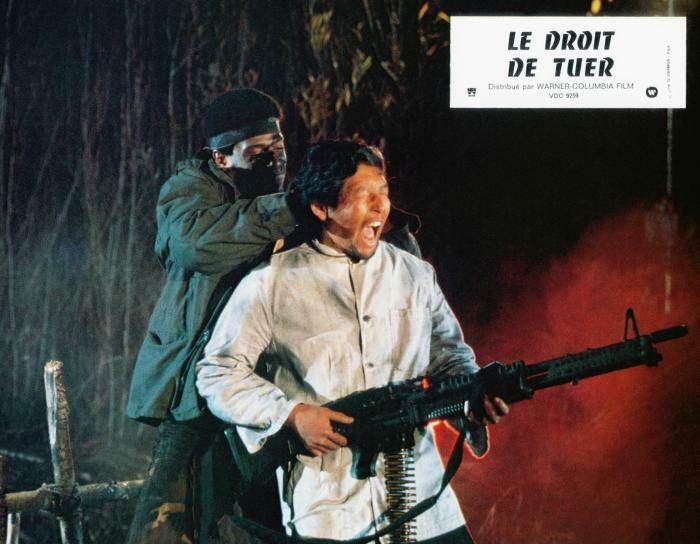 Grindhouse fans can rest assured that they’ll finally get an archive-worthy edition of The Exterminator for their collection with this set – and the fact that it offers both a blu-ray and a DVD (both with the same features) is the icing on the exploitation flick cake. Schlock-Wire: ZOMBIE Returns To Blu-Ray, DVD… And A Theater Near You! Another expertly-penned review, Don. Had me salivating for my own copy. Thanks, Jack. This is one you want for the permanent collection.